Hunting hearing aids are small devices that fit in or behind the ear. These devices amplify ambient sound so you can hear your surroundings better than you could with your naked ears. When a weapon is fired, the amplifier circuit reacts instantly, limiting volume in your ears to a safe level. Once the loud sound passes, the device resumes amplifying the ambient sound. Also Available: Custom Molds for Earphones and Other Devices. Many newer hunting hearing aids take the form of electronic ear plugs that sit entirely in the ear, with no BTE piece or sound tube. Providing smart protection and enhanced situational awareness in a compact in-ear design, electronic ear plugs are equivalent to a high-end electronic shooter's ear muff. Low-cost hunter's hearing aids provide less noise protection and poorer sound quality than the digital models. However, they do feature sound amplification. Some people even buy these devices as an alternative to expensive medical hearing aids. Looking for regular hearing aids? Go Here. (NRR 30/22) The Ghost Stryke Essential provides critical features for the shooter/hunter, including hearing enhancement of safe sounds, hearing protection against gunblasts and other dangerous noises, and an ergonomic fit that is reliable and comfortable. Sleek and compact design. (NRR 26) SoundGear Digital Behind the Ear Hearing Protection and Enhancement Device - Silver, features crisp, clear amplification of low volume sounds and instant protection from dangerously loud sounds, whether constant or impact noises such as gunfire. Silver model includes volume control, and 2 user selectable sound modes. (NRR 22/30) The Ghost Stryke Essential features Bluetooth connectivity. Provides critical features for the shooter/hunter, including hearing enhancement of safe sounds, hearing protection against gunblasts, and a reliable, comfortable ergonomic fit. Sleek and compact design. (NRR 26) SoundGear Digital Behind the Ear Electronic Hearing Protection and Enhancement Device - Platinum, features crisp, clear amplification of low volume sounds and instant protection from dangerously loud sounds, whether constant or impact noises such as gunfire. Platinum model includes volume control and 4 user-selectable sound modes. (NRR 25) The Silynx Clarus PRO Tactical In-Ear Hearing Protection and Audio Headset System provides hearing enhancement/amplification, hearing protection, and smartphone audio connectivity, all in one compact and ruggedized package. Includes smartphone audio adapter cable. (NRR 25) SoundGear Instant Fit Digital Electronic Hearing Protection and Enhancement Devices provide a no-compromise combination of both situational awareness and hearing protection for the hunter, shooting enthusiast, military or law enforcement professional or the home shop hobbyist. (NRR 30) SportEAR Ghost Stryke by AXIL, Universal fit Hunting Hearing Aids With Lynx Digital Sound Compression are in a class by themselves. The advanced Lynx digital sound compression amplifies low volume sounds such as voices and game sounds by up to 6 times normal, while simultaneously limiting dangerously loud sounds to a safe 85 dB. (NRR 30) Ghost Stryke II Universal fit Hunting Hearing Aids improve on the original Ghost Stryke design with even better hearing enhancement. Safe sounds are amplified by up to 8x, while gun blast noise and other hazardously loud sounds are limited to a safe 85 dB. SportEAR Select-A-Fit Model 30 Universal Fit ITE Hunting Hearing Aids give you five sizes of tips to choose from for a semi-custom fit right out of the box, 30dB gain, two digital channels, background noise suppression and whistle canceller. The SportEar MicroBlast 30 features AutoBlocker Digital Compression and advanced DSP sound processing, making these an ideal choice for both hunting/shooting and for daily use. 2 channels, background noise canceller, whistle canceller, and 30dB gain. (NRR 30) Mini-BigShots CIC brings the speech enhancement and hearing protection shooters and hunters need, in an extremely low-profile design that will fit easily under helmets and hats. Protect from blast noises with BigShots. Ideal for range shooting, competition shooting, and hunting. (SNR 32) These electronic hunter's hearing aids offer three big features for all hunters and sport shooting aficionados: hearing protection, sound enhancement, and waterproof construction. Futuristic features and plush memory foam eartips make this an incredible choice for shooting. (NRR 29) BigShots Electronic Shooters Ear Plugs provide protection from gunshot noise, 5x amplification of safe sounds, and medical-grade circuitry to deliver top-quality speech enhancement. Preserve situational awareness for shooting, hunting, and industrial settings. (NRR 29) BigShots Electronic Shooters Ear Plugs provide protection from gunshot noise, 5x amplification of safe sounds, and medical-grade circuitry to deliver top-quality speech enhancement. Preserve situational awareness for shooting, hunting, and industrial settings. 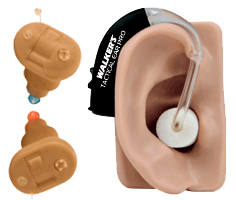 These are full custom molded ear pieces for an unparalleled fit. SportEAR Select-A-Fit Model 210 Universal Fit ITE Hunting Hearing Aids give you five sizes of tips to choose from for a semi-custom fit right out of the box, 36dB gain, two digital channels, 10 band programmable equalizer, background noise suppression and whistle canceller. The SportEar MicroBlast 210 features AutoBlocker Digital Compression and advanced DSP sound processing, making these an ideal choice for both hunting/shooting and for daily use. 2 channels, 2x background noise canceller, 2x whistle canceller, and 36dB gain. SportEAR Select-A-Fit Model 210 Universal Fit ITE Hunting Hearing Aids give you five sizes of tips to choose from for a semi-custom fit right out of the box, 42dB gain, four digital channels, 12 band programmable equalizer, four selectable program settings, background noise suppression and whistle canceller. The SportEar MicroBlast 412 features AutoBlocker Digital Compression and advanced DSP sound processing, making these an ideal choice for both hunting/shooting and for daily use. 4 channels, 3x background noise canceller, 3x whistle canceller, and 42dB gain. The SportEar MicroBlast 812 features AutoBlocker Digital Compression and advanced DSP sound processing, making these an ideal choice for both hunting/shooting and for daily use. 8 channels, 3x background noise canceller, 3x whistle canceller, and 48+dB gain.